Marie McMonagle (center) and her daughter Heather (right) stand amidst other protesters outside the Bangor International Airport on Sunday in opposition to President Donald Trump's order to restrict people from seven Muslim-majority countries from entering the United States. "He needs a reality check," said Marie McMonagle. There also were protests at Portland International Jetport and Portland City Hall. 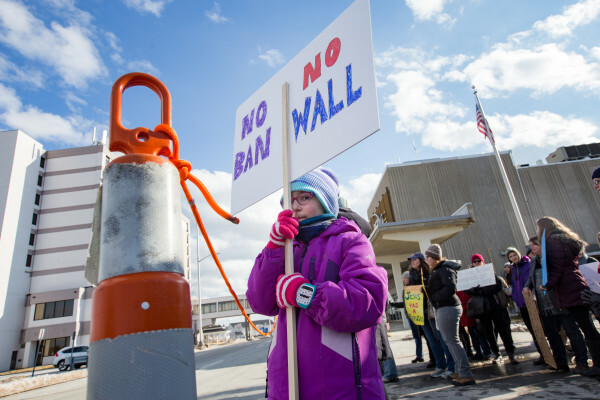 Lilliana Griswold, 10, stands at attention to spin her double-sided sign reading "No Ban, No Wall" on one side and "Respect existence or expect resistance" on the other during a protest at Bangor International Airport on Sunday in opposition to President Donald Trump's order to restrict people from seven Muslim-majority countries from entering the United States. Griswold, of Old Town, attended with family, and her mother Sonya explained that after a monthly potluck at the Islamic Center of Maine Saturday, the takeaway from the local Muslim community was one of fear. "Everyone was so scared for their families and themselves. Nobody knows what will happen tomorrow," she said. "That fear makes it so we have to do this. You shouldn't have to be afraid to be an American." People gather at Bangor International Airport on Sunday to protest President Donald Trump's order to restrict people from seven Muslim-majority countries from entering the United States. There were also protests at Portland International Jetport and Portland City Hall. 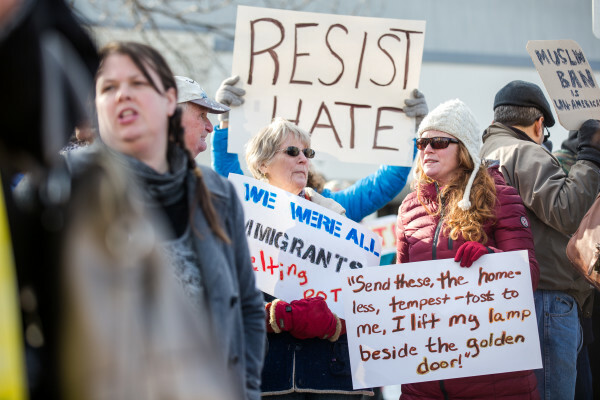 BANGOR, Maine — A global backlash against President Donald Trump’s executive order banning immigration from seven Muslim nations saw pockets of protest erupt across Maine on Sunday. Perhaps the largest demonstrations took place at airports in Bangor and Portland and at Portland City Hall. 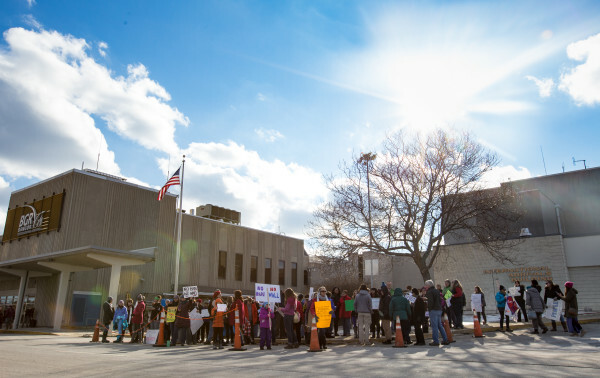 In Bangor, nearly 150 people over the afternoon — including representatives of the Islamic Center of Maine in Orono — protested Trump’s move in front of the airport’s international arrivals terminal. 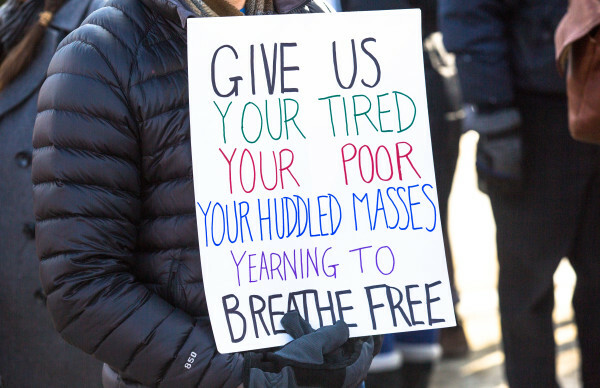 Most of them were outraged, chanting anti-Trump and other slogans and carrying signs in support of immigrants and unity, and against Trump and his ban. But the rally was peaceful and there was no police presence. Many participants shared their own immigration stories and experiences during the rally that started at about 11 a.m. and continued through midafternoon. “Yesterday, there was a gentleman named [Hameed Khalid] Darweesh who was detained at [JFK Airport],” City Councilor Sean Faircloth told the crowd. According to published reports, the Iraqi, who served as an interpreter for the 101st Airborne, was detained for 19 hours even though he held a special visa that took him two years to obtain. “The leader of the U.S. Army airborne division said Mr. Darweesh had saved many lives, many lives of our men and women in uniform over there in Iraq and that is who Donald Trump is blocking — blocking patriotic citizens, patriotic prospective citizens and we need to stand up to Donald Trump,” Faircloth said. Bangor City Council Chairman Joe Baldacci told those assembled that Trump’s order flies in the face of basic American values. “This isn’t just about immigrants,” he said. “This is about all of us as a country and where we’re headed. We believe in the United States as the symbol of freedom. This is showing us that we are trampling on the freedom of millions of people and this isn’t the American way. Dina Yacoubagha, whose husband Tameem Alsamsam is president of the Islamic center in Orono, said she was moved by the show of support at the rally for immigrants and for Muslims. Before he spoke to the protesters, Sen. Geoff Gratwick, a Bangor Democrat, spoke about what immigrants can bring to Maine. “We need immigrants here. We talk a lot in the Legislature about the demographic order and the fact that the death rate in Maine is higher than the birth rate. If Maine is going to survive, it’s going to need to have a lot of outsiders, an infusion of talent,” he said. “Lewiston now has 7,000 immigrants. There are some that are having a hard time but there are many that are creating a very vibrant world in terms of downtown revitalization, education, farming,” Gratwick said. Amy Smith of Lincolnville, who organized the demonstration, created a Facebook page about the event around 6 p.m. Saturday and word spread quickly. “We have to be the voice for people who can’t [advocate for themselves] right now. We have to stand up for what we believe in. Those of us with privilege need to use it to bring about change and stand up against what is happening,” she said. Protesters called on Maine’s congressional representatives to denounce Trump’s order restricting citizens of Iraq, Iran, Syria, Yemen, Sudan, Libya and Somalia from entering the United States. Already, members of Maine’s congressional delegation have spoken out against the travel ban, according to the Sun Journal. Independent U.S. Sen. Angus King believes the administration’s actions “don’t protect us, but actually compromise our nation’s security,” said Scott Ogden, his spokesman. Democratic Rep. Chellie Pingree also criticized the order, while Republican Rep. Bruce Poliquin was noncommittal in response. Around 10:30 a.m., a crowd of protesters gathered outside Portland City Hall to protest Trump’s order, according to Portland-based television station CBS 13. CBS 13 reported that thousand of protesters turned up at Portland International Jetport but that no one had been detained. Bangor International Airport Director Tony Caruso said there were no ban-related problems at that facility on Sunday. Bangor Daily News writer Christopher Burns, Reuters and CBS 13 contributed to this report.